You don’t have to go to boot camp to get fit—you can have fun doing it at this one-of-a-kind exercise class. 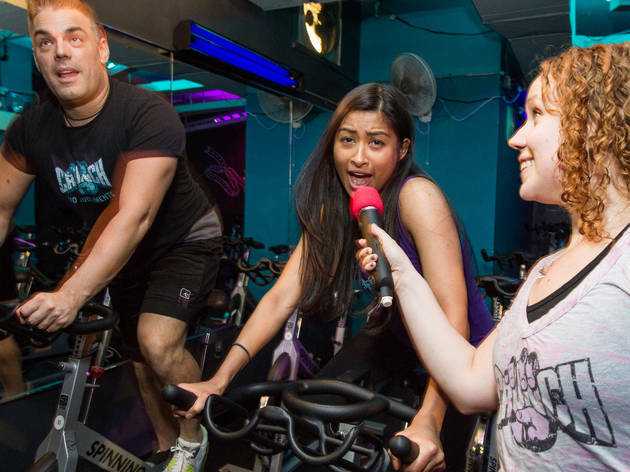 Crunch Gym’s Cycle Karaoke lets you feel the burn and belt out your favorite tunes (instructors will even take requests). 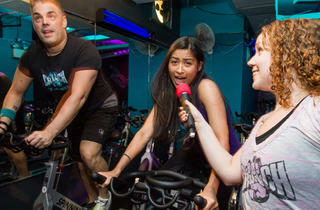 I love the idea of Spinning, but all those boutique places are a bit terrifying. Is there anything less intimidating I can try? Totally! 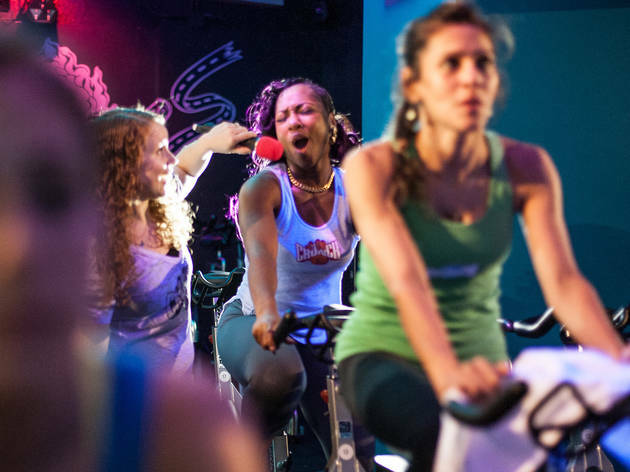 Crunch Gym offers a Cycle Karaoke class that’s equal parts workout and party—minus the crazy choreography and Lululemon fanaticism. 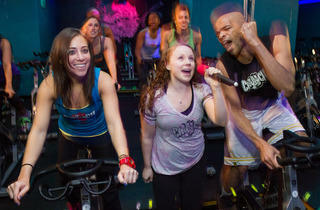 Let me get this straight: You want me to sing and exercise at the same time? Yes, but it’s not as insane as it sounds. 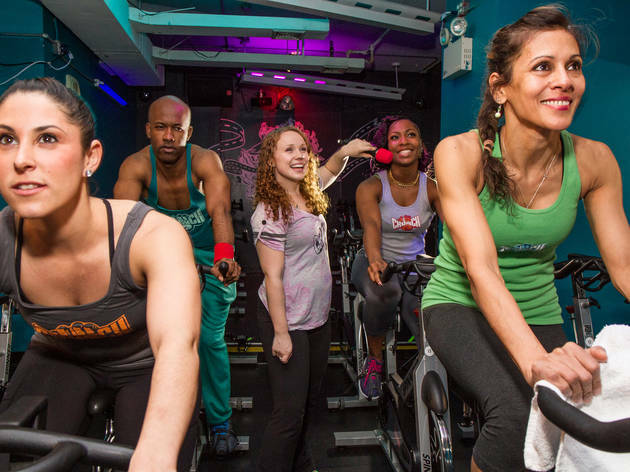 The whole idea behind the concept of Spinning is that you’re pedaling in sync with the beat of a soundtrack, and adjusting the resistance to keep yourself steady and supported. 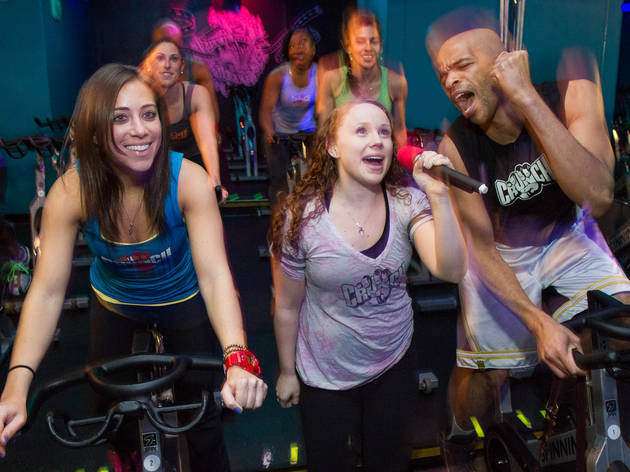 During Cycle Karaoke’s 45-minute session, the instructor mixes up karaoke tracks (like Def Leppard’s “Pour Some Sugar on Me”) with techno-driven songs such as Avicii’s “Levels,” as lyrics appear on the flatscreen TVs at the front of the room. Most of the singing happens during the slow- to medium-paced songs—the ones that mimic hills and flat roads—so you’re not trying to bust out the lyrics to “Baby Got Back” while your legs are going at Road Runner speeds. There’s also no crazy up-and-down, back-and-forth choreography to follow; you’re either seated or hovering with your rear just above the bike saddle. That leaves you free to focus on putting on your best Justin Timberlake–meets–Jillian Michaels performance. Do I have to sing by myself? Not if you don’t want to. The instructor stays at the front of the room to cue and motivate the group while an assistant moves around the studio with a wireless microphone, giving willing participants the chance to solo. Everyone in the class is encouraged to belt their hearts out, but you can totally pass on taking the lead. Keep in mind though, just like normal karaoke, it’s energy and spirit that count most. Absolutely! Call up the location where you’re taking the class, and ask for the teacher’s name and e-mail address. If you shoot the MC your wish list at least 48 hours before showtime, they will try to squeeze in one of your jams. Okay, be honest—how much am I gonna hurt the next day (and I don’t just mean my pride)? One of the nice things about indoor cycling is that you control the resistance on the bike, so it’s as hard or as easy as you make it. 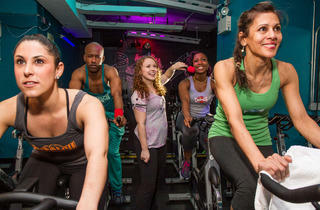 Since the class is primarily cardio, most of the burning will be in your lungs during the actual class. If your general activity level is low, though, your quads and calves might be sore for a day or two. No pain, no gain, right? 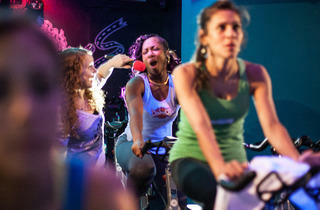 Cycle Karaoke is at Crunch Gym (various locations; visit crunch.com for details). Monthly membership starts at $84.99; guest pass $35.